The onions are dressed with vinegar, the cheese is slightly tangy Red Leicester, the bacon and pickles are...bacon and pickles. Then he takes finely chopped iceberg lettuce and mixes it into a sauce that one might say is 'special'—mayo and ketchup with chipotle Tabasco, Worcestershire, and a splash of booze (just go with it; it works and is silly good). 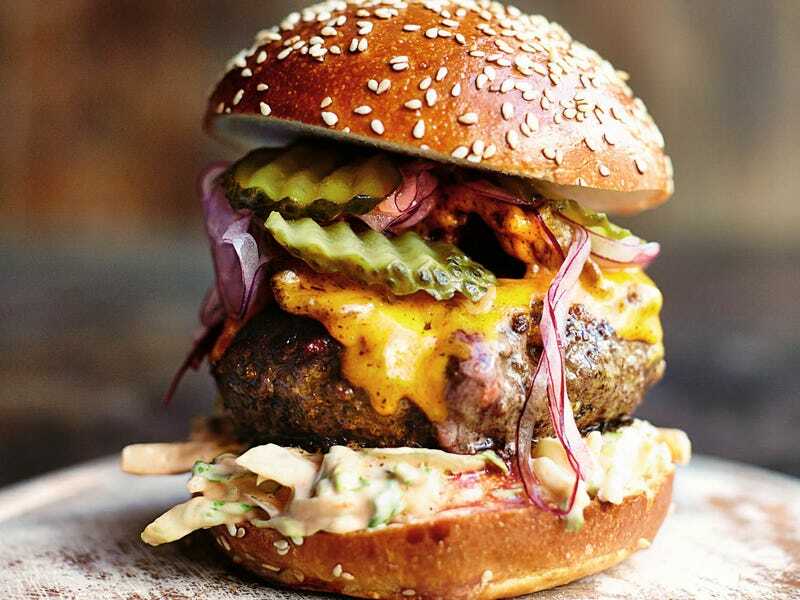 The burger itself gets glazed with mustard and more of the smoky Tabasco while it cooks, then it's all piled on a seeded brioche bun, which has been briefly toasted in the bacon fat. Bonkers. If you like Jamie Oliver's recipes check out his new book Comfort Food.